Navassa Island (/nəˈvæsə/; French: l'île de la Navasse; also La Navasse, La Navase) is a small uninhabited island in the Caribbean Sea. Located northeast of Jamaica, south of Cuba, 40 nautical miles (46 mi; 74 km) west of Jérémie on the south west peninsula of Haiti, the island is subject to an ongoing territorial dispute between Haiti and the United States, which officially administers it through the U.S. Fish and Wildlife Service. The U.S. has claimed the island since 1857, based on the Guano Islands Act of 1856. Haiti's claim over Navassa goes back to the Treaty of Ryswick in 1697 that established French possessions in mainland Hispaniola, that were transferred from Spain by the treaty. As well as the western half of the main island and certain other specifically named nearby islands, Haiti's 1801 constitution also claimed "other adjacent (but unnamed) islands". Navassa was not one of the named islands. Since its 1874 Constitution, and after the establishment of the 1857 U.S. claim, Haiti has explicitly named "la Navase" as one of the territories it claims. Navassa Island is about 2 square miles (5.2 km2) in area. It is located 35 miles (56 km) west of Haiti's southwest peninsula, 103 miles (166 km) south of the US naval base at Guantanamo Bay, Cuba, and about one-quarter of the way from mainland Haiti to Jamaica in the Jamaica Channel. Navassa reaches an elevation of 250 feet (76 m) at Dunning Hill 110 yards (100 m) south of the lighthouse, Navassa Island Light. This location is 440 yards (400 m) from the southwestern coast or 655 yards (600 m) east of Lulu Bay. The terrain of Navassa Island consists mostly of exposed coral and limestone, the island being ringed by vertical white cliffs 30 to 50 feet (9.1 to 15.2 m) high, but with enough grassland to support goat herds. The island is covered in a forest of four tree species: short-leaf fig (Ficus populnea var. brevifolia), pigeon plum (Coccoloba diversifolia), mastic (Sideroxylon foetidissimum), and poisonwood (Metopium brownei). Navassa Island's topography, ecology, and modern history are similar to that of Mona Island, a small limestone island located in the Mona Passage between Puerto Rico and the Dominican Republic, which were once centers of guano mining, and are nature reserves for the United States. Transient Haitian fishermen and others camp on the island but the island is otherwise uninhabited. It has no ports or harbors, only offshore anchorages, and its only natural resource is guano. Economic activity consists of subsistence fishing and commercial trawling activities. There were eight species of native reptiles, all of which are believed to be, or to have been, endemic to Navassa Island: Celestus badius (an anguid lizard), Aristelliger cochranae (a gecko), Sphaerodactylus becki (a gecko), Anolis longiceps (an anole), Cyclura (cornuta) onchiopsis (a rock iguana), Leiocephalus eremitus (a curly-tailed lizard), Tropidophis bucculentus (a dwarf boa), and Typhlops sulcatus (a tiny snake). Of these the first four remain common with the last four likely extinct. Feral cats, dogs and pigs currently inhabit the island. In 2012, a rare coral species (Acropora palmata - Elkhorn coral) was found underwater near Navassa Island; its population has been reduced by 98%. The coral was found to be in good condition. 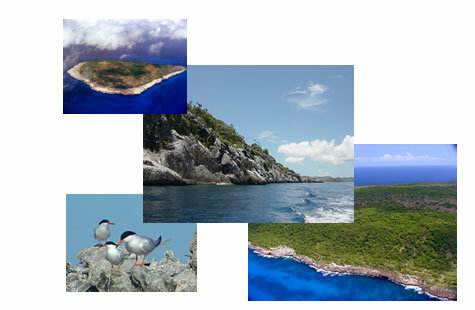 Navassa Island is west of Haiti's southwest peninsula, south of Cuba, east of Jamaica. From 1801 to 1867 the successive constitutions of Haiti claimed vaguely national sovereignty over adjacent islands, both named and unnamed, although Navassa was not specifically enumerated until 1874. Navassa Island, however, had already been claimed for the United States on September 19, 1857 by Peter Duncan, an American sea captain, under the Guano Islands Act of 1856, for the rich guano deposits found on the island, and for not being within the lawful jurisdiction of any other government, nor occupied by another government's citizens. Haiti protested the annexation, but on July 7, 1858, U.S. President James Buchanan issued an Executive Order upholding the American claim, which also called for military action to enforce it. Navassa Island has since been maintained by the United States as an unincorporated territory (according to the Insular Cases). The United States Supreme Court on November 24, 1890, in Jones v. United States, 137 U.S. 202 (1890) Id. at 224 found that Navassa Island must be considered as appertaining to the United States, creating a legal history for the island under US law unlike many other islands originally claimed under the Guano Islands Act. As listed in its 1987 constitution, Haiti maintains its claim to the island. Guano phosphate is a superior organic fertilizer that became a mainstay of American agriculture in the mid-19th century. Duncan transferred his discoverer's rights to his employer, an American guano trader in Jamaica, who sold them to the newly formed Navassa Phosphate Company of Baltimore. After an interruption for the American Civil War, the company built larger mining facilities on Navassa with barrack housing for 140 black contract laborers from Maryland, houses for white supervisors, a blacksmith shop, warehouses, and a church. Mining began in 1865. The workers dug out the guano by dynamite and pick-axe and hauled it in rail cars to the landing point at Lulu Bay, where it was put into sacks and lowered onto boats for transfer to the Company barque, the S.S. Romance. The living quarters at Lulu Bay were called Lulu Town, as appears on old maps. Railway tracks eventually extended inland. Hauling guano by muscle-power in the fierce tropical heat, combined with general disgruntlement with conditions on the island, eventually provoked a rebellion in 1889, in which five supervisors died. A U.S. warship returned eighteen of the workers to Baltimore for three separate trials on murder charges. A black fraternal society, the Order of Galilean Fisherman, raised money to defend the miners in federal court, and the defense built its case on the contention that the men acted in self-defense or in the heat of passion, and that the United States did not have jurisdiction over the island. E.J. Waring, the first black lawyer to pass the Maryland bar, was a part of the defense's legal team. The cases, including Jones v. United States, 137 U.S. 202 (1890) went to the U.S. Supreme Court in October 1890, which ruled the Guano Act constitutional, and three of the miners were scheduled for execution in the spring of 1891. A grass-roots petition driven by black churches around the country, also signed by white jurors from the three trials, reached President Benjamin Harrison, who commuted the sentences to imprisonment and mentioned the case in a State of the Union Address. Guano mining resumed on Navassa at a much reduced level. The Spanish–American War of 1898 forced the Phosphate Company to evacuate the island and file for bankruptcy, and the new owners abandoned the island after 1901. Navassa became significant again with the opening of the Panama Canal in 1914. Shipping between the American eastern seaboard and the Canal goes through the Windward Passage between Cuba and Haiti. Navassa, a hazard to navigation, needed a lighthouse. The U.S. Lighthouse Service built Navassa Island Light, a 162-foot (49-meter) tower on the island in 1917, 395 feet (120 meters) above sea level. A keeper and two assistants were assigned to live there until the Lighthouse Service installed an automatic beacon in 1929. After absorbing the Lighthouse Service in 1939, the U.S. Coast Guard serviced the light twice each year. The U.S. Navy set up an observation post for the duration of World War II. The island has been uninhabited since then. Fishermen, mainly from Haiti, fish the waters around Navassa. A scientific expedition from Harvard University studied the land and marine life of the island in 1930. After World War II amateur radio operators occasionally visited to operate from the territory, which is accorded "entity" (country) status by the American Radio Relay League. The callsign prefix is KP1. From 1903 to 1917, Navassa was a dependency of the U.S. Guantanamo Bay Naval Base, and from 1917 to 1996 it was under United States Coast Guard administration. In 1996 the Coast Guard dismantled the light on Navassa, which ended its interest in the island. Consequently, the Department of the Interior assumed responsibility for the civil administration of the area, and placed the island under its Office of Insular Affairs. For statistical purposes, Navassa was grouped with the now-obsolete term United States Miscellaneous Caribbean Islands and is now grouped with other islands claimed by the U.S. under the Guano Islands Act as the United States Minor Outlying Islands. In 1997 an American salvager made a claim to Navassa to the Department of State based on the Guano Islands Act. On March 27, 1997, the Department of the Interior rejected the claim on the basis that the Guano Islands Act applies only to islands which, at the time of the claim, are not "appertaining to" the United States. The department's opinion said that Navassa is and remains a U.S. possession "appertaining to" the United States and is "unavailable to be claimed" under the Guano Islands Act. A 1998 scientific expedition led by the Center for Marine Conservation in Washington, D.C., described Navassa as "a unique preserve of Caribbean biodiversity." The island's land and offshore ecosystems have survived the 20th century virtually untouched. In September 1999, the United States Fish and Wildlife Service established the Navassa Island National Wildlife Refuge, which encompasses 1,344 acres (5.44 km2) of land and a 12 nautical mile (22.2 km) radius of marine habitat around the island. Later that year, full administrative responsibility for Navassa was transferred from the Office of Insular Affairs to the U.S. Fish and Wildlife Service. Due to hazardous coastal conditions, and for preservation of species habitat, the refuge is closed to the general public. Visitors need permission from the Fish and Wildlife Office in Boquerón, Puerto Rico, to enter its territorial waters or land. Since it became a National Wildlife Refuge, amateur radio operators have repeatedly been denied entry. In October 2014 permission was granted for a two-week DX-pedition in February 2015. The operation made 138,409 contacts. ^ a b c "GAO/OGC-98-5 - U.S. Insular Areas: Application of the U.S. Constitution". U.S. Government Printing Office. November 7, 1997. Archived from the original on July 6, 2013. Retrieved March 23, 2013. ^ Spadi, Fabio. "NAVASSA: LEGAL NIGHTMARES IN A BIOLOGICAL HEAVEN?". IBRU Boundary and Security Bulletin, Autumn 2001. p. 116. Archived from the original on December 1, 2017. Retrieved November 22, 2017. ^ a b "Windows on Haiti: Navassa Island". windowsonhaiti.com. Archived from the original on November 2, 2014. ^ Constitution de 1874. Port-au-Prince: Haiti. ^ Serge Bellegarde (October 1998). "Navassa Island: Haiti and the U.S. – A Matter of History and Geography". windowsonhaiti.com. Archived from the original on October 29, 2007. Retrieved February 6, 2008. ^ Rohter, Larry (October 19, 1998). "Whose Rock Is It? Yes, the Haitians Care". Port-au-Prince Journal. The New York Times. Archived from the original on November 23, 2012. Retrieved January 28, 2012. ^ Ewan W. Anderson (January 27, 2014). Global Geopolitical Flashpoints: An Atlas of Conflict. Taylor & Francis. pp. 277–. ISBN 978-1-135-94101-7. ^ a b c CoRIS - NOAA's coral reef information system. "Navassa Island". National Oceanic and Atmospheric Administration. Archived from the original on November 2, 2012. Retrieved November 16, 2012. ^ US Fish & Wildlife Service. "Navassa National Wildlife Refuge". US Fish & Wildlife Service. Archived from the original on November 11, 2012. Retrieved November 17, 2012. ^ a b Central Intellenge Agency. "The World Factbook - Navassa Island". Central Intellenge Agency. Archived from the original on November 19, 2012. Retrieved November 16, 2012. ^ "Archived copy". Archived from the original on October 19, 2017. Retrieved July 20, 2017. CS1 maint: Archived copy as title (link) Strangest island in the Caribbean may be a sanctuary for critically endangered coral. Julian Smith. 16 July 2012. Retrieved 11 January 2018. ^ Brennen Jensen (March 21, 2001). "Poop Dreams". Baltimore City Paper. Archived from the original on October 25, 2012. Retrieved November 16, 2012. ^ a b John Pike. "Navassa Island Incident 1889-1891". GlobalSecurity.org. Archived from the original on November 2, 2012. Retrieved November 16, 2012. ^ "The History Of American Imperialism, From Bloody Conquest To Bird Poop". NPR.org. Retrieved February 22, 2019. ^ Russ Rowlett (University of North Carolina at Chapel Hill). "'Navassa Island Lighthouse'". The Lighthouse Directory. Archived from the original on November 20, 2012. Retrieved November 17, 2012. ^ a b c Joe Phillips (November 2, 2005). "'Ohio DXers Denied Descheo Island (KP5) Landing Permit'". The ARRL Letter Vol 24 No 06. Archived from the original on January 5, 2013. Retrieved November 17, 2012. ^ a b "Navassa Island". Washington, D.C.: U.S. Department of the Interior. Archived from the original on August 15, 2016. Retrieved March 3, 2018. ^ "Warren v. United States". Archived from the original on May 17, 2010. ^ US Geological Survey(August 2000). "Navassa Island: A Photographic Tour (1998–1999)". US Geological Survey. Archived from the original on November 19, 2012. Retrieved November 18, 2012. ^ "KP1-5 Project Gets Permission to Activate Navassa Island (KP1) in January 2015". ARRL, the national association for Amateur Radio. October 22, 2014. Archived from the original on October 19, 2015. Retrieved March 31, 2016. ^ "K1N Navassa Island DXpedition is Ham Radio History". www.arrl.org. Archived from the original on November 15, 2017. Acanthemblemaria harpeza is a species of chaenopsid blenny found around Navassa Island, in the western central Atlantic ocean. Cochran's croaking gecko (Aristelliger cochranae), also commonly known as Cochran's Caribbean gecko and the Navassa gecko, is a species of lizard in the family Sphaerodactylidae. The species was first described in 1931 by Chapman Grant and named after notable American herpetologist and artist Doris Mable Cochran. The species received one of its common names from the loud croaking call of the male during the mating period. The Navassa Island iguana (Cyclura cornuta onchiopsis) was a subspecies of rhinoceros iguana that was found on the Caribbean island of Navassa. It is "undoubtedly" extinct. Emblemaria vitta, the Ribbon blenny, is a species of chaenopsid blenny found around Navassa Island, in the western central Atlantic ocean. It is known to reach a length of 1.8 centimetres (0.71 in) SL. Gillellus inescatus, the flagfin stargazer, is a species of tropical sand stargazer native to the Caribbean sea. The Jamaica Channel is a strait separating the islands of Jamaica and Hispaniola, in the Caribbean Sea. Along with the Windward Passage to its north. Due to its location about 1,000 kilometres (620 mi) north-east of the Panama Canal, it is a main sea lane through which vessels with Pacific Ocean destinations sailing from the eastern seaboards of the United States and Canada, as well from Europe, frequently pass.The strait is about 190 kilometres (120 mi) wide with depths of up to 1,200 metres (3,900 ft). The Paleobiology Database lists no known fossiliferous stratigraphic units in Dominica, Saint Kitts and Nevis, Saint Lucia, Saint Vincent and the Grenadines. The database also records no fossiliferous stratigraphic units within several regions of the Caribbean like the Archipelago of San Andrés, Providencia and Santa Catalina, Guadeloupe, Martinique, Bonaire, Saba, Sint Eustatius, and Nueva Esparta. This is a list of islands of Haiti. Lulu Town is a now uninhabited, former settlement on Navassa Island, claimed by both the United States and neighbouring Haiti, in the Caribbean. Navassa Island Light is a deactivated lighthouse on Navassa Island, which lies in the Caribbean Sea at the south end of the Windward Passage between the islands of Hispaniola (Haiti and the Dominican Republic) to the east and Cuba and Jamaica to the west. It is on the shortest route between the east coast of the United States and the Panama Canal. The light was built in 1917 and deactivated in 1996. The light is gradually deteriorating from lack of maintenance. The keepers' house is roofless and in ruins.The importance of the light before the advent of GPS is evident in the fact that it has the twelfth-highest tower and fourth-highest focal plane of all U.S. lights. Navassa Island National Wildlife Refuge protects coral reef ecosystems, native wildlife and plants, as well as provides opportunities for scientific research on and around Navassa Island. The National Wildlife Refuge is located 35 miles (56 km) west of the Tiburon Peninsula of Haiti. The refuge encompasses 1,344 acres (5.44 km2) of land and a 12 nautical mile (22.2 km) radius of marine habitat around the island. Navassa Island features large seabird colonies including over 5,000 nesting red-footed booby (Sula sula). Navassa is home to four endemic lizard species. Two other endemic lizards - Cyclura cornuta onchiopsis and Leiocephalus eremitus, are extinct.Navassa Island NWR is administered as part of the Caribbean Islands National Wildlife complex. Due to hazardous coastal conditions, and for preservation of species habitat, the refuge is closed to the public. The Navassa curly-tailed lizard (Leiocephalus eremitus) is an extinct lizard species from the family of curly-tailed lizards (Leiocephalidae). It is known only from the one female specimen from which it was described in 1868. A second specimen which was collected by Rollo Beck in 1917 was identified as a Tiburon curly-tailed lizard (Leiocephalus melanochlorus) by herpetologist Richard Thomas in 1966. The rhinoceros iguana (Cyclura cornuta) is a threatened species of lizard in the family Iguanidae that is primarily found on the Caribbean island of Hispaniola, shared by the Republic of Haiti and the Dominican Republic. They vary in length from 60 to 136 centimetres (24 to 54 in) and skin colours range from a steely grey to a dark green and even brown. Their name derives from the bony-plated pseudo-horn or outgrowth which resembles the horn of a rhinoceros on the iguana's snout. Tropidophis bucculentus, the Navassa Island dwarf boa, was a nonvenomous dwarf boa species endemic to Navassa Island. No subspecies are currently recognized.